Seattle Car Accident Investigations | Davis Law Group, P.S. If you or a loved one has been involved in a car accident in Seattle or elsewhere in Washington state, it is vital that you act quickly to preserve the necessary evidence and obtain information of other parties involved in the collision if you wish to pursue a personal injury claim. The chances of a successful resolution to your car accident case depends upon proving that the other driver involved in the collision was at-fault for your injuries. This requires a thorough and legally-focused investigation into the circumstances of the crash, ideally led by an attorney and legal team with experience conducting car accident investigations. Davis Law Group is a leading car accident law firm serving accident victims throughout Seattle, the Puget Sound, and the rest of Washington state. Our attorneys and legal support team have decades of experience in conducting investigations into all types of car accidents, including rear-end accidents, T-Bone collisions, drunk driving crashes, head-on collisions, roadway debris accidents, dangerous roadway design incidents, mechanical failures, and more. Finding the right lawyer to handle your car accident case is a very important step in serious injury cases. If you or a loved one has been inured in a car accident, our attorneys are here to help you fight for fair compensation. If a car accident occurs and the property damage is significant or someone was injured, the local police will typically respond to the scene to conduct their own investigation. The responding officer should document the incident – including information about all involved parties, vehicles, and injuries – and begin an investigation of the circumstances and factors that may have contributed to the crash. 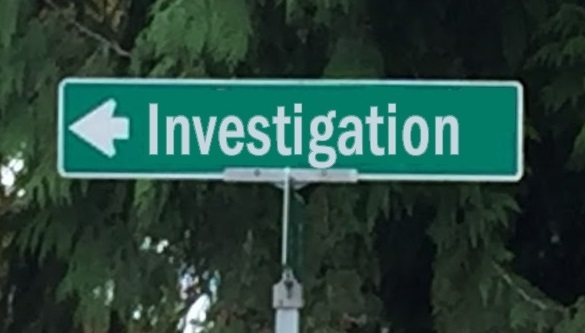 In some cases, such as a rear-end collision between two vehicles at an intersection, for example, this investigation process may be very quick and straightforward. On the other hand, a multi-vehicle crash on a rainy day in rush hour traffic might be more complicated and could involve multiple parties being found responsible. Once the officer has finished interviewing witnesses to the collision and analyzed the evidence available, he or she will typically produce a Police Traffic Collision Report (PTCR) which summarizes the investigation and includes a narrative describing the incident and how it occurred. Insurance companies representing parties involved in a car accident may also conduct their own investigation into a car accident if they do not believe the officer’s investigation was accurate, or in situations where the police did not respond to the scene. And of course, if an accident victim decides to hire a personal injury attorney to handle their car accident claim, the law firm will likely conduct its own investigation as well. In a perfect world, every car accident would be caught on crystal-clear video. But generally, the purpose of a car accident investigation is to recreate the scene, gather evidence, and retrieve statements from people who may have witnessed the collision from different perspectives. There is a great deal of evidence that must be collected at the scene of a collision in order to support a car accident victim’s personal injury claim. Photographs should be taken at the scene to illustrate weather and roadway conditions, the vehicles involved in the collision, and the severity of the incident. Another goal of any scene investigation is determining the point of impact, as the property damage and debris at the scene can help paint a better picture of how the vehicles were positioned at the point of impact and whether any roadway debris may have played a role. Scene reconstruction experts will typically use photos from the scene to help regenerate a model of the scene and illustrate what the evidence indicates is likely to have taken place. There is a lot of valuable information that can potentially be discovered through inspecting all of the vehicles that were involved in a given car accident. The two most important pieces of information that investigators hope to learn from a vehicle inspection are the extent of the damage to the vehicle, as well as the condition of the vehicle at the time of the incident. The severity of the damage and location of markings should help investigators determine the angle and point of impact, among other things. Inspecting the vehicle’s brakes, airbags, alignment, and similar issues will help determine if the vehicle was in proper condition or if a faulty product may have contributed to the accident. Documenting witnesses’ accounts of the incident – which may potentially come from several different people with varying perspectives and viewpoints – can help sort out the “he-said, she-said” nature of car accident claims. Insurance companies will compare witnesses’ statements with the police report and their own investigation to determine if the facts support a given conclusion about liability. In some cases, the insurance companies will make their own determination separate from the responding police officer, and may even end up contradicting the officer’s conclusions. Not all cases require the assistance of an accident reconstruction expert. But in extreme situations where liability is being strongly contested and/or the accident victim has suffered serious injuries, it may be worth hiring an accident reconstruction expert to use all of the information from the investigation to reconstruct the scene and illustrate, based on their own expertise, what exactly is likely to have happened. The goal of an accident reconstructionist is to determine a number of factors, such as the direction of travel, the length of skid marks (which can help indicate vehicles’ speed and braking patterns), the point of impact, distance traveled after impact, and other factors. If you or a loved one has been badly injured in a car accident, it’s very important that the crash is investigated quickly and that all evidence is properly documented. A thorough investigation can drastically improve the chances of a successful outcome for your case. Having an experienced car accident attorney on your side to conduct a thorough investigation into your accident case can make all the difference in the outcome of your personal injury claim. Our attorneys offer a free case review to anyone who has been injured in a car accident. We also work on a contingency fee basis, which means there are no up-front costs and you owe no fees until your case has been successfully resolved. Call (206) 727-4000 or use the confidential contact form on this page to have your case reviewed absolutely free by our attorneys and award-winning legal team.